Download the product file from the Pivotal Network. 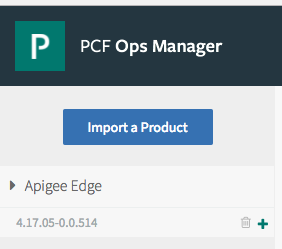 In the Ops Manager, select Import a Product to upload the product tile. Select the plus (+) icon to accept the tile. The 4.17.05 tile replaces the existing 4.17.01 tile. Select Apply changes to start the update. When the update completes, you return to the Ops Manager. For information on the new features available in 4.17.05, see 4.17.05 - Edge for Private Cloud release notes.